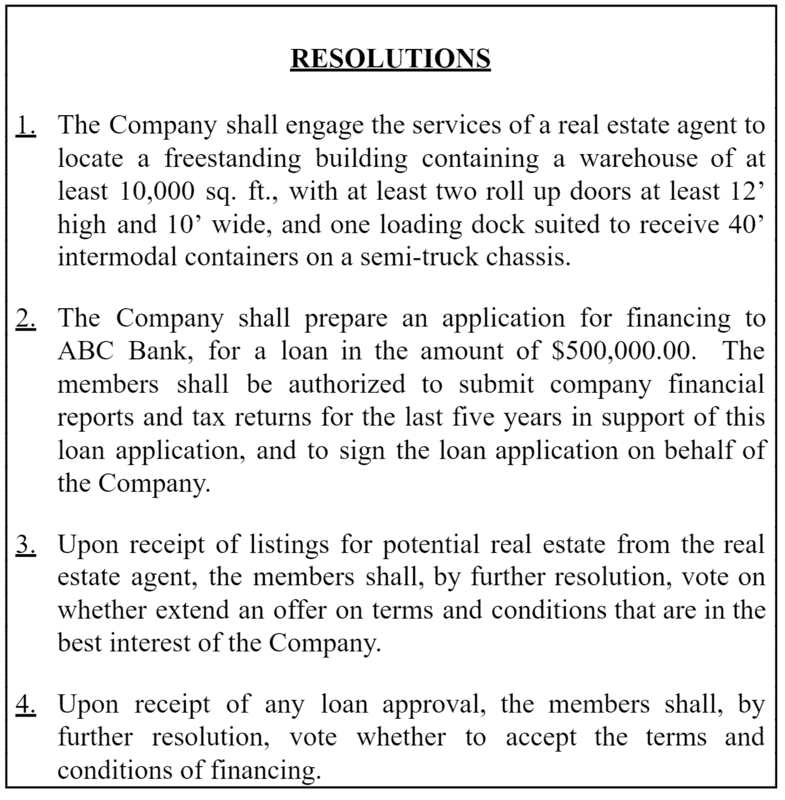 A "resolution" is a written record of a decision by an LLC, and is signed by the company's members or managers. Written resolutions are an important method of documenting the company's business, and should be utilized for all major company decisions and all transactions involving members (for example, loans to or from members or the like). The title of a resolution informs the reader what the document is about. It can be something as simple as "Member Resolution," or something more specific like "Member Banking Resolution" or "Resolution to Purchase 123 Main Street." 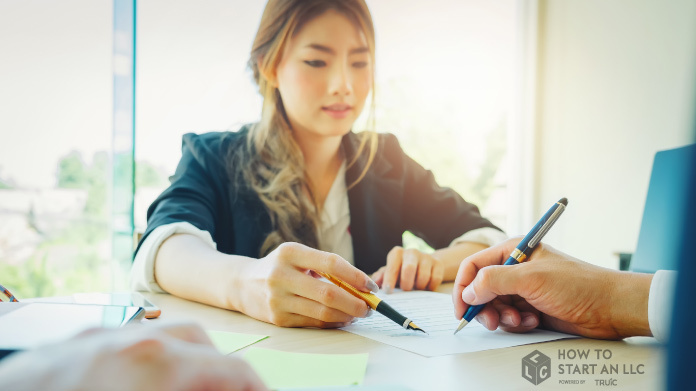 After the title comes an introduction paragraph that says the document is a resolution of the named LLC, the date the resolution was adopted, and that it was adopted pursuant to the company's Operating Agreement. The next section in a resolution is optional, and it is usually referred to as the "Recitals." A "recital" in this context sets forth background information about the subject of the resolution and the reasoning for the decisions to follow later in the resolution. 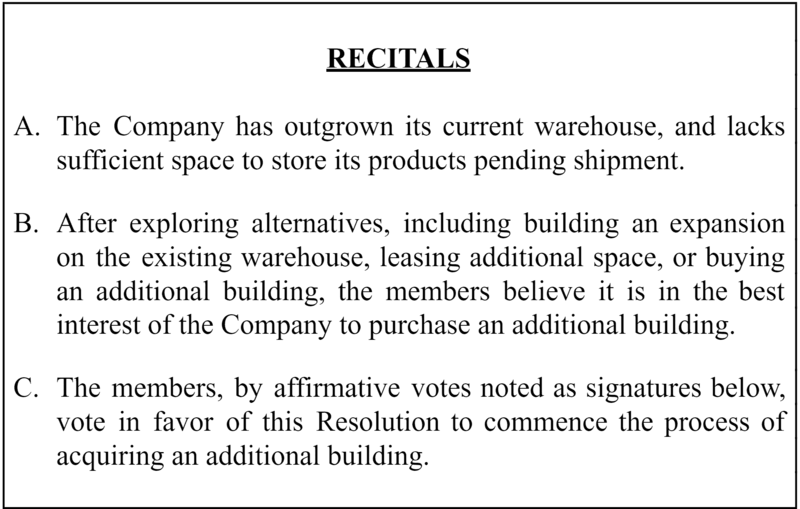 These recitals may, but need not, be written starting with the word "Whereas," as in "Whereas, the Company has determined that it would be benefited by X because . . . ."
The "Resolutions" section of the document contains the actual decisions of the Company, reflected by the votes of the members. These resolutions may, but need not, be written starting with the word "Resolved," as in "Resolved, the Company shall X . . . ."
At the close of the resolution, there is typically a statement that addresses the voting of the members and how the votes are to be reflected in the resolution. They could be reflected by signatures of the members, in which case the resolution would state something like: "By affirmative votes noted as signatures below, a majority vote in interest of LLC Units approves the form and content of this resolution, to be effective immediately." The resolution could also be formatted for each member to check a box, yes or no, to reflect votes alongside each member's signature. Then, the members would each sign as members for the LLC. To download an LLC resolution template, sign up for our Business Center.